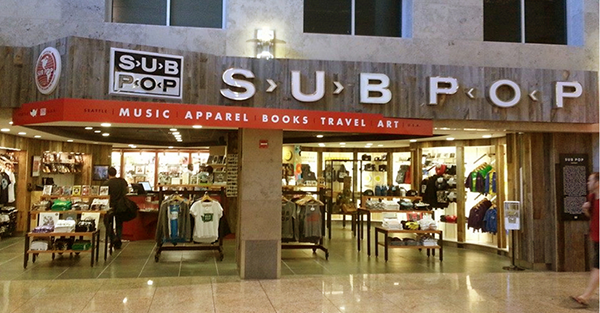 The Sub Pop Airport Store at Sea-Tac Airport is a mix of the classic Sub Pop Mega Mart and a Pacific Northwest-centric gift shop. We collaborated with designers, artists, and companies who also call the Pacific Northwest home and created a vast array of brand new Sub Pop and PNW-related wares for your enjoyment. So, if you’re flying into, out of, or have a layover in Seattle, stop by the entrance to Concourse C between the hours of 6am–10pm. For more photos, see our blog post about the grand opening. Seattle-Tacoma International Airport, on the "sterile" side of security near the C gate. So, mostly only accessible to ticketed passengers.